At first glance, Matthew Webber's paintings don’t look much like landscapes. 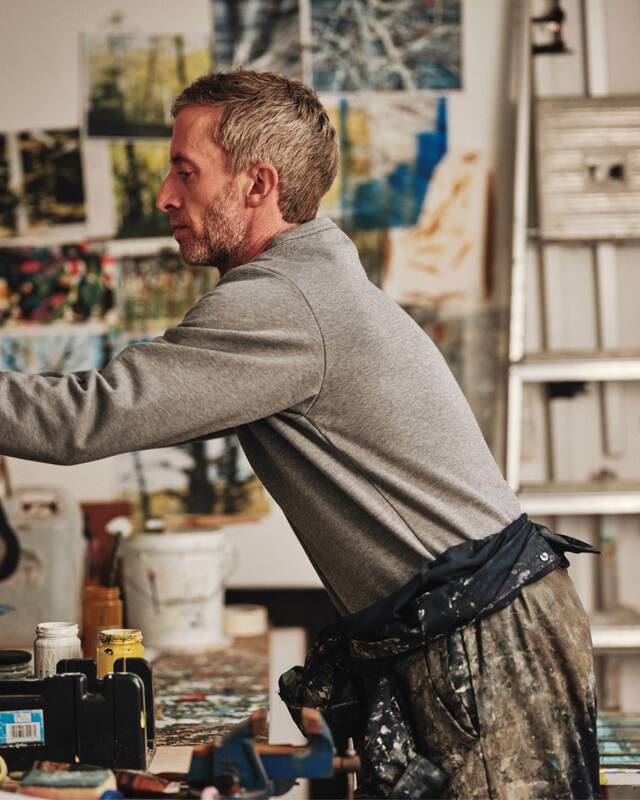 Streaks of primary colours that bleed together in collapsing grids, or interweave as they radiate to the edges of the canvas, they bring to mind Jackson Pollock's drip paintings more than anything Turner might have put on canvas. But look closer and nature slowly emerges: seemingly random lines coalesce into branches scraping across blue sky; banks of colour become a hedge dotted with flowers. 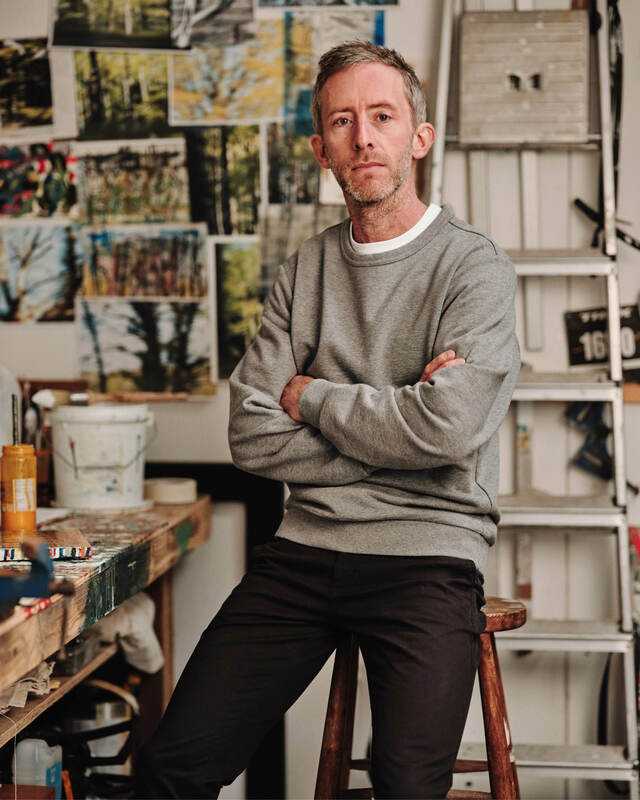 His work documents the world outside the windows of his studio, which is nestled in his garden in the outer edges of east London, where the city blurs into Epping Forest. 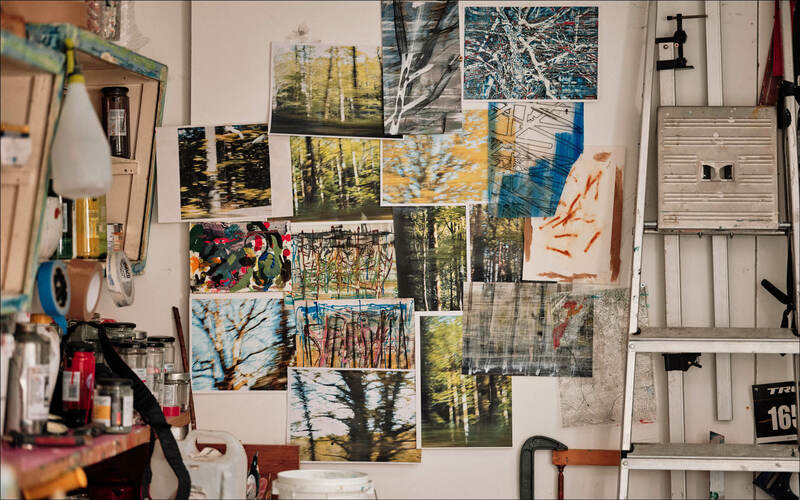 For two decades, Webber has worked here, refining his abstract approach to landscape painting. 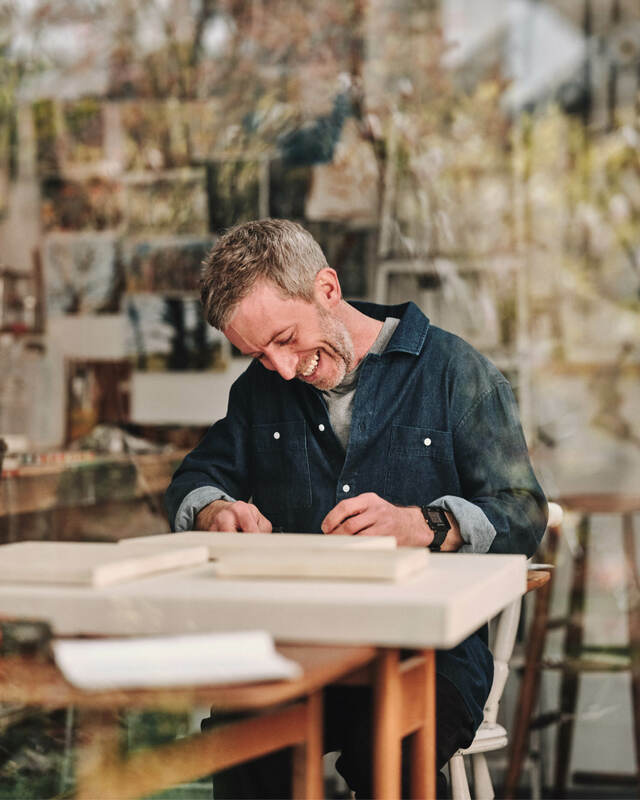 “Sometimes I’ve been more focused on representing a landscape and other times it’s been more about creating a landscape within the work,” he says. Cycling can often seem very regimented, whereas your paintings embrace chance and randomness. Is there a tension between those parts of your life? There’s a lot of regimented, rhythmic elements to the work, actually. The way that the paint’s applied is often very structured and repetitive. There’s a lot of repetitive processes that I tend to use, the results of which are affected by those chance interactions between the layers of paint. So getting out into the woods, I tend to use that as my downtime. Reviewing video footage of the ride, that’s where it becomes useful. But the ride itself is a release. When you’re ‘destroying’ the paintings, how do you know when you’ve gone far enough? Have you ever gone too far? You’ve got to be bold, I suppose, and just trust your instincts. I think I have trashed some good paintings along the way, but there’s always next time. There’s always hope with something you’ve gone too far with, because that becomes the basis for another piece of work where what’s left behind will still be part of a final image. Just not that final image. It’s a funny process, really, because the final 20 minutes is when it counts, after maybe six months of applying paint to a surface. It’s a very exciting moment, that uncovering. It’s a bit like sculpture. Sometimes I describe it as archaeological. You’re going back through the layers, the surfaces, to try and find interesting things. Who have you been inspired by and how have they filtered into the way you approach your own work? Way back in art school I was struggling with the idea of being a landscape painter, which seemed quite an old-fashioned thing. I saw an exhibition by a group of painters who were purely concerned with the materials that they were using and making. 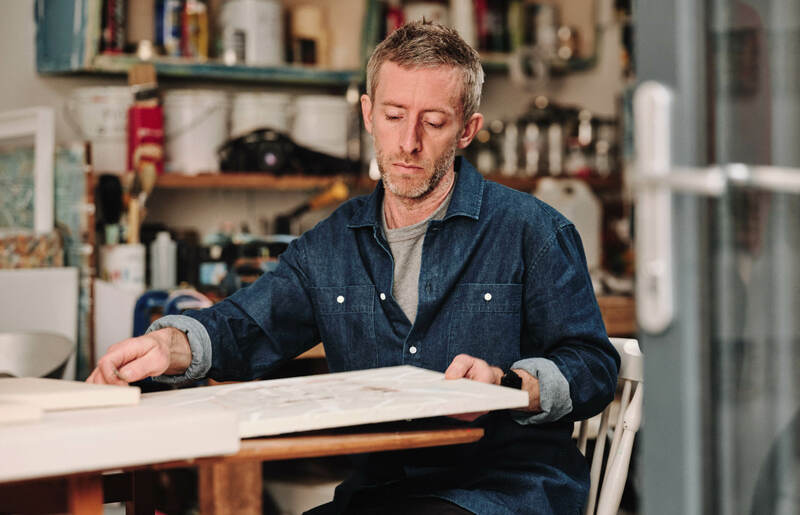 It was artists like Ian Davenport, who’s gone on to great things, and a guy called Jason Martin whose paintings were just one enormous brush stroke. They were so beautiful and simple and elegant and I realised that what I was interested in was a similar thing. It was like I was using a landscape as an excuse to make paintings that were about painting. It’s like when you’re a kid, you draw a map, or you draw an island and you create this vista that is all your own, all of your own making. 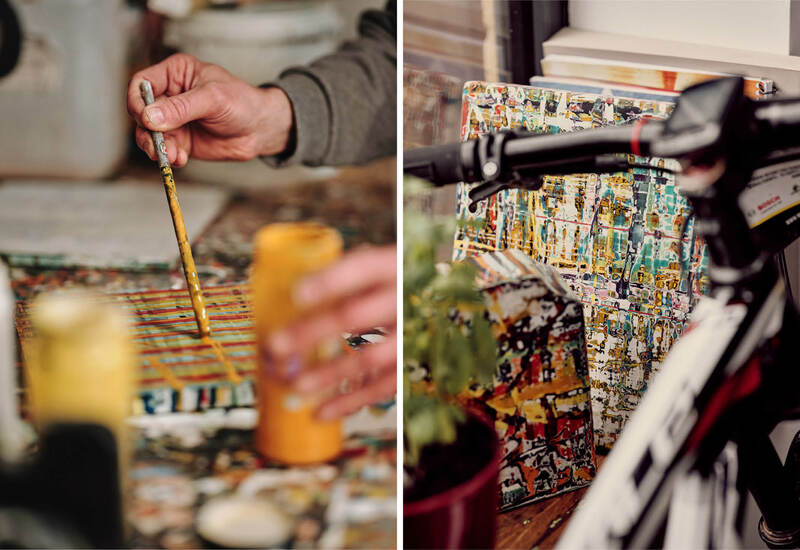 Do you think about the paintings on your bike, or is it purely a ‘release’, as you put it? I’ll get glimpses or ideas, but I tend not to be really thinking about anything except the path ahead. If you’re riding off-road, like I do, you have to be really focused on where you’re going because it’s very easy to misjudge something and plough into a tree. It’s the pain of training, but also the pleasure in being out in – not exactly wilderness – but as wild as it gets in this part of east London. How long have you been competing for? I did it when I was a teenager and I’ve come back to it over the last 10 years. I’ve found that it’s something I’m reasonably good at and enjoy, and because of where we live there’s surprisingly plenty of opportunities for off-road adventures. I race cyclocross all through the winter for a local team, then mountain bike I do through the summer months. Do these very different sides of your life inform the kind of clothes that you wear? My wardrobe’s about comfort and ease. I like things that are well-made and are going to last. It applies to my work, too, but I’m trying to reduce my footprint over my life and I’m using found objects to paint on, reclaimed timber, chunks of wood I’m sourcing from the forest. I like to wear things that are going to last me a very long while. Things that are going to look better as they get older. Do you wear specific clothes to paint in? Often, if I just take a little stroll down to the studio, I’ll forget to put my overalls on and start tinkering with a painting and before I know it I’ve been in there for two hours, sloshing paint around. I’ve lost count of the number of jumpers and shirts and pairs of trousers and pairs of shoes I’ve kind of ruined covering them in paint. But it sort of adds to the character and there’s a story to the clothing as well. Especially my overalls. They’ve been accumulating paint for 20 years. There’s a story there as well, I suppose.